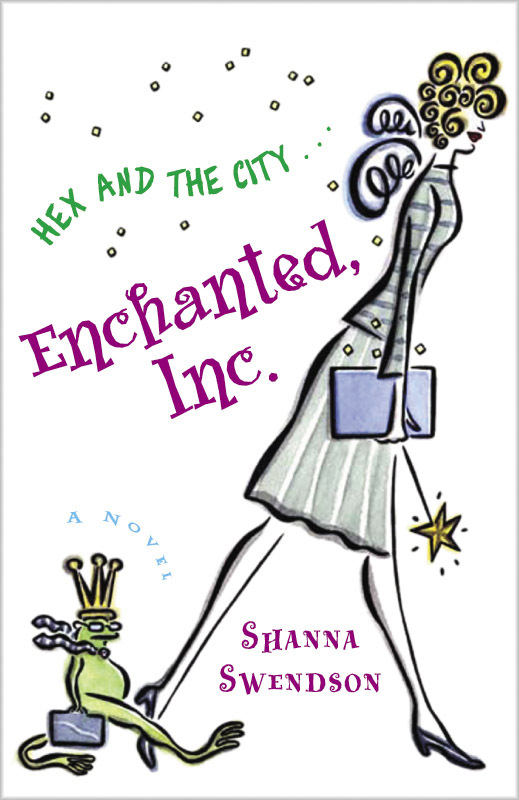 In the last couple of years, I did an “author commentary” on Enchanted, Inc., going a few chapters at a time and discussing where I got the ideas or what I intended for various parts of the book. This is the whole commentary compiled into one document. There are spoilers for the whole book, obviously! I wrote the opening line around the time I started plotting — and a lot of that work was done in an airplane on the way to a meetup of Firefly fans. We were gathering in Wildwood, NJ, and my plan was to get a ride afterward to Philadelphia and take the train from there to New York so I could do my research. There ended up being a couple of people who’d driven down from New York, so they gave me a ride and dropped me off in Queens, where I could catch a train (it’s elevated in Queens but becomes the subway in Manhattan) to my hotel. On that train ride, at one point the connecting door between cars opened and an entire mariachi band came onto the car and started playing — and no one else on the car so much as looked at them. They were kind of hard to ignore, but you’d have thought they were invisible. I’ve since learned that these kinds of buskers are common and the best strategy is to ignore them because giving them any attention just makes things uncomfortable, but at the time, it struck me as really odd. I felt like I was the only person on the train who could see them. And that inspired the incident on the subway in the opening chapter. I figured that if something real and odd happened and nobody else noticed it, then it would set the stage for something magical and odd happening and no one else noticing. That way we don’t think Katie’s incredibly dense for not noticing the magic stuff. A lot of that trip was going around and finding locations for the story. I knew I wanted Katie to be working in lower Manhattan, so I took the subway down there and wandered around until I found an appropriately soulless office tower. Then I walked back to where her home would be so I could time the walk and take note of what she’d pass along the way. In the first draft, that section was a lot more detailed because I wanted to fit in all those observations, but ended up cutting it because, really, it was just walking home from work and we needed to get on with the story. I’d been in that area before, which was why I’d chosen it for the setting, but since I hadn’t been planning on writing a book set there the last time I’d been there, there were a lot of details I hadn’t noticed. I’d originally planned for Sam to be one of the gargoyles at Grace Church, which is so very gothic-looking that it must have gargoyles, but when I stopped by there to see what the gargoyles looked like, I discovered that there weren’t any. Oops. But then I had the big “duh” moment and realized that there would be gargoyles only Katie would see. There really is a magic shop around the corner from the church, and since I was there in late September, there was also a Halloween costume shop nearby. The recruitment e-mail was the idea that sparked the whole story, when I was wishing I’d get an e-mail for a magical job offer, but I tried to play it somewhat realistically in the book. Would you really jump at such a vague overture, or would you be leery of it? So I then had to set up a situation so awful that she’d end up taking the bait. Sadly, that miserable meeting wasn’t too far from so many I’ve sat through, and the evil boss Mimi is based on some people I’ve worked with — a client and a co-worker. Both people had a bad habit of changing their minds and then rewriting their mental history so that the new thing they wanted was always what they wanted, and therefore when you gave them exactly what they’d asked for earlier, you were doing it wrong. All the stuff with the roommates and going out for drinks came from me trying to hew close to the line of the chick-lit genre. In a way, I was writing this as a spoof, but I also wanted it to be a good example of the genre itself. I needed to balance the magic stuff with the normal girl-in-the-city stuff, so I gave her friends who allowed for those chick-litty scenes. That was also part of me trying to be somewhat realistic and grounding the “real” part of the story to contrast with the magic. The company I’d worked for had an office in New York, and I’d heard the people from that office talking about their living situations. I based the idea of these three women crammed into a small apartment on what I heard about the life of 20-something professionals in New York. I even tried to do some research on rents and floorplans to make sure it was somewhat feasible. Actually, this sounds pretty luxurious compared to some of the stories I heard. I think the group of roommates was also somewhat inspired by some people I knew in college. There was a group of people a year ahead of me in the journalism program who’d decided that if they didn’t go to New York right after college, they might never do so, so as graduation neared, they were hunting for jobs and apartments. There were four of them, and they were all going to cram into a small apartment, using sofabeds so that the living room would also be a bedroom. That’s where I got the group from college in Texas going to New York together. It was a real blast from the past to reread chapter three, the one where Katie first really meets Owen during that informal job interview meeting. I’m pretty critical of my own work, but I really like the writing for that scene. That was also the scene where Owen came to life and started taking over. I really didn’t have grand plans for him at that point. He mostly existed to contrast with Rod, the unattractive guy everyone else seemed to find irresistible, as the attractive guy no one noticed. But once he appeared in the scene, he really came to life and I fell a bit in love. That was a case of sheer character alchemy because I did next to no pre-writing character development on him, no planning. He just stepped onstage and came to life. I did more work on him later, but it was more about teasing out what already seemed to be there than about creating it. I knew I had something when the friend I was sending chapters to responded rather strongly and wanted to know all about him. The magically somewhat hidden office building was another detail that came from my research trip. I wanted the company to be based in lower Manhattan, as it would have been the kind of thing there from some of the earlier settlement. There are some old buildings in that part of town, and I did a lot of wandering and taking pictures. But I didn’t find the building itself until I got home and got my film developed (yes, this was in the Dark Ages). I’d been taking photos at the park in front of City Hall because there were actual gaslights, and I thought that was cool. But in the background of those photos was a building that had actual turrets on a narrow side street. I’d walked past it and had taken all those photos without even seeing it. It’s actually a fairly modern building built in an old style, but I figure that’s just the cover the real world sees. A building I only saw when I looked in the background of a photo I took of something else seemed like the perfect candidate for my headquarters. The magical farmers’ market was an addition that came in copyedits. I’d visited the market during my research trip and wrote in that visit. Then after I sold the book, I took another trip to New York for additional research and to meet my new editor, and I headed to the market, only to find that it was closed that day of the week — which was the day of the week I had Katie visiting it. I told my editor about this when we met, and we decided that, duh, it was a magical market the rest of the world didn’t see, so I added that bit when I got the copyedits, and I think it even strengthened Katie’s decision to make the leap to the new job, since she’d learned enough to realize what was really going on and knew she’d never really be “normal” again. Chapter Five was my big moment of Mimi catharsis. Wow, I must have been working out a lot of frustrations there. Mimi was kind of a combination of everyone I’ve ever worked for or with and hated, and it was a fantasy quitting moment. I have had a couple of chances to quit a job I was really unhappy with, and turning in that letter feels so good, though I never made a public scene like that. I certainly fantasized about it. I came up with the idea for this book at a time when I was really unhappy at work and dealing with a supervisor who seemed threatened by me, so the wonderful job offer was a big fantasy at the time, then I wrote it a little more than a year after I got laid off from that job because the supervisor who was threatened by me lost us our biggest client (funny, she got to stick around — though the client ended up hiring me as a freelancer). I seem to recall enjoying writing that scene. The group blind date was loosely based on a real date I once went on. I’d been introduced to him at a group outing, and he seemed pretty cool then. It was when we went out one-on-one that things got weird because he just didn’t talk. I’m a slow eater anyway, and if I’m having to carry 100 percent of the conversation, I’ll never finish my meal. I tried asking him questions, but he didn’t seem to have any interests that got him passionate enough to say more than a sentence. I felt like I was interrogating him and needed to get out the torture implements. I finally told him that if he ever wanted me to finish my meal so we could leave the restaurant, he would have to say something. Instead, he got up and went to the bathroom. At least I got to eat. So I guess I was working out frustrations there, but most of it was to introduce Ethan. It was also one of the “chick lit” elements I was fitting in as I both blended the genres and spoofed the genre. In later books I didn’t really worry about that so much, but with the first book, I thought my best bet for selling it would be to sell it as chick lit, so I was consciously including those elements. In Chapter Six I was introducing the magical company, and I can tell looking back that I was trying really, really hard to make it Magical! There’s a lot of stuff I threw in that I practically forgot to use later because it no longer seemed quite so important to highlight the magical nature of things. Like those crystal balls. I think that came out of the idea of what magical people would use for intra-office communication or something like the Internet. I had to keep remembering that they were supposed to be there in later books. We also meet Jake, Owen’s assistant, in that chapter. He was basically human scenery, but little details about him just seemed to come out as I wrote that made him come to life (and I didn’t plan most of it). I don’t think there was enough to him to ever make him a focus, but he was fun in the background, and I did later enjoy giving him a bit of a hero moment in book 7. Katie goes to work at the magical company and finds that her job is anything but magical. It’s like being part of a secretarial pool, and she’s working with a bunch of annoying people. I tried to imagine what effect being immune to magic would have on someone’s personality, and I figured that if you were around magic a lot but didn’t know it until adulthood you might end up being kind of flighty or really geeky. Then unless you were pretty grounded, being a rare commodity might make you full of yourself. I think I was having fun with expectations there, making the magical workplace be rather drab, but I think that’s a common experience, even without the magic. When you’re interviewing for a job, they make it look like this wonderful place, and then it seems like an entirely different place once you accept the job and show up to work. The crazy boss Gregor, who turns into an ogre — literally — when he gets angry, was one of the earlier ideas I had when I first started mentally developing this world, and he was based on someone I used to work with. He could seem totally reasonable and even nice, and then suddenly he’d snap. He didn’t turn green, but he did turn a scary purple color, and he didn’t sprout fangs and horns, but the effect was similar. I knew the moment I started thinking about a magical workplace that a boss who’s literally an ogre would be absolutely mandatory. Chapter Seven was a lot of me playing with the premise, showing what Katie’s job was really like. I must admit that I’d forgotten about the use of magic carpets on business after this book, so that’s why they come back in book six. Otherwise, I was trying to show the “normal” of Katie’s new magical life before I upended it again. We had to see what the potential problems might be and what her normal work was like in order to set up what she’s going to want to change or have to deal with. This is also when I started dropping hints that there’s more going on. That’s when the main plot first arrives after our origin story of getting Katie into this world has finished. I think one of my favorite scenes in the book was the one where Katie visits Owen’s office and spots the fake book, then sees and tries to fight off the intruder. That whole segment was so vivid to me, from the setting to the people. Just skimming it how, it pops right back into my head. So, chapter nine is when the real plot really gets started after we get all the origin story stuff out of the way. Katie has learned that her big boss really is the Merlin. That was one of the ideas that had been swimming around in my head ever since I came up with the concept of a magical corporation. I was planning to do a spoof of corporate life — in fact, one of my pitches for the concept was “Bridget Jones Meets Harry Potter and Goes to Work with Dilbert” — and I’d just come from a workplace that loved all the various management fad things. If someone wrote a quirky business book about how some odd little premise could totally transform your company, you could bet we’d be having a corporate retreat based on it, complete with theme t-shirts or giveaways. This is why I have a koozie shaped like a fish (it had something to do with a book on how throwing fish like they do at the Seattle fish market could change the way you do business — I don’t think they meant it literally, but even after reading the book I wasn’t sure quite how they meant it, and throwing foam “fish” koozies “improved” our business to the point that a huge chunk of the staff, including me, was laid off less than a year later). So I thought it would be a lot of fun for the boss to be an ancient wizard who’s only recently discovered modern business practices and gets excited about every little fad because it’s all new to him. And then I had a burst of inspiration in remembering that in a lot of the Arthurian mythology they say that Merlin was entombed in a crystal cave, to be brought back again when he was needed. And, duh, who else should be running a magical corporation? But that then ended the idea of him running off with every business fad because he should be smarter than that. I think I kept a few references to the idea that he was reading all this stuff and finding it fascinating, but he’s not forcing the whole company to abide by this week’s business reading. Anyway, I then read as much as I could find about Merlin in order to create my character, including how his name would actually translate (depending on which version you go with). And, of course, they had to be facing a threat severe enough to require him to be brought back. Then we got to one of my other core ideas, using modern business practices like marketing to get an edge in the magical world. Since I was inverting the usual fantasy structure by having my heroine learn that she didn’t have magical powers, I thought it would also be fun to have real-world things be the solution for people who are used to getting what they want with a wave of the hand. I wasn’t planning it at the time, but looking back at the series, one of the things I really like about how it shaped up was the relationship between Merlin and Katie. I like how open he is to her ideas, in spite of his great age, wisdom, power, and experience. I started a short story once about his initial emergence from hibernation. Maybe I should get back to that. I think we’re getting to the really fun part of the story. Not only has the plot kicked in, but this is the part where I got to do what Save the Cat author Blake Snyder called “the promise of the premise” or the “fun and games” part of the story. In Hero’s Journey terms, we’re in Tests, Enemies, and Allies. Our heroine is in a new world, and she’s getting to experience what that entails. It’s a book about a “normal” person working for a magical company, so we’re getting to see more of what that’s like. So in chapter eleven we get to see how a spell might be tested, with the help of a magical immune who can read it without carrying it out. In my magical corporation metaphor, I was thinking of spells as being kind of like software. They’re bits of code that allow things to happen. If I read raw code out loud, nothing would happen, but if you make a computer read it, it does something. So a magical person reading a spell might make something happen (depending on the spell), but someone with no magic is safe. This is why these people are so valuable to the company. Then we get to one of my favorite parts of the book and the scene I usually read when I’m doing a reading at conventions: the girls’ night out scene. I have to give my agent credit for how this worked out. In my original draft, the gang just went out for drinks and talked. I thought it was clever that the magical people thought that kissing frogs was actually a viable way of meeting men, because it would be in their world. When I first signed on with my agent and she gave me some revision suggestions before she submitted the book, she said they shouldn’t just talk about it. They needed to actually go to the park and look for frogs. That kicked off a bunch of other things, including introducing some new characters who got woven into the story. In chapter thirteen, we’re continuing the frog-kissing scene, where we get the guy who just thinks he’s been turned into a frog. I’m pretty sure that was my idea. I know my agent suggested they actually go kiss frogs, but there weren’t any details beyond that. It kind of spiraled outward from there, with ongoing ramifications. One of those ramifications was that one of Katie’s roommates ended up dating the guy who really had been turned into a frog. My agent and I had decided that we were going to market the book as chick lit rather than fantasy because of the way the market stood at the time (I’m still not sure if that was a great decision in retrospect, since chick lit tanked soon afterward and urban fantasy took off, but then again I’m not sure how well the book would have been received by fantasy houses. Even fantasy editors who loved these books have nixed everything else I’ve written). I needed to add a little more “real world” chick lit content by showing all the stuff with the friends, dating, etc. Having one of those dates be with a guy who’d been turned into a frog for nearly a century was a good way to add that content while keeping the fantasy element strong. And then there was the effect of the fake frog spell. Of course he’d fall in love with the woman who broke the spell, because that’s how it tends to go. But what if the woman isn’t in love with him? The bad blind date was already in the book, with Ari and her friends interrupting things and making it go all wrong. Throwing in the fake frog guy just took it up a notch to make it a real disaster. I’ve had some miserable blind dates in my time, thanks to well-meaning people whose idea of “you’re perfect for each other” boiled down to “you’re both single,” but this went well beyond anything I’ve experienced. This was also a good way to show how Katie’s life has changed. There was the setup early in the book that was a normal bad blind date, with nothing to talk about. Now she has this magical life, and it’s still not working out, but it’s not working out in spectacular ways. I’m getting all nostalgic over this section of the book because it was so much fun to write, and even if I write more books in the series, I’m not sure I could quite recapture this feeling because at that time it was so fresh for both me and the character. We pick up with the attack after the bad blind date, kind of an adding insult to injury situation. I was trying to give Katie some personal stakes of feeling endangered because of her activities. This was one last chance for her to turn back, and at this point she’s fully committed to the cause. When I was initially thinking about this series, I’d planned for there to be several viable guys, so it wasn’t so much a romantic triangle as her having multiple options and there being some suspense as to which one she’d eventually pick as the series progressed. I envisioned ‘shipper wars breaking out, with each guy having a faction. That all went pretty much straight to hell the moment I started writing Owen, but I was still valiantly trying in this book. The scene in which Rod takes Katie home to help her recover from the attack was meant to be a chance to see him outside his usual persona so that he became a viable relationship possibility. Now it just looks to me like him being a good friend, probably because in my mental canon, at this point Rod already knows that Owen is into Katie, so he’s actually playing wingman here. And then we get into one of the elements that was in the concept almost from the beginning: using some of the real world’s most fearsome creatures against the enemy: lawyers! That brings us to potential suitor number 3, Ethan, the lawyer who may be a magical immune. I had a lot of fun writing the testing scene, startling subtly and then getting so over the top that he’d have to notice. Incidentally, this was one of my “restaurant killer” scenes. I have a really weird track record when it comes to incorporating restaurants from the real world into my books, going back to my early romance novels. If I set a scene in a restaurant that’s directly based on a real one, that particular restaurant will soon close or go out of business. In this case, I used a cafe near Washington Square I’d been to a couple of times. I had breakfast there with a friend once when I was there on a business trip, then I had dinner with a group a year or so later when I was there for a conference. It was exactly the kind of place I wanted for this scene, so I set it there. I don’t think I was really specific about what it was, but if you knew the area, you probably knew what I meant. On a later trip, I saw that it was closed. I suspect there’s a restaurant (or something) there again because space doesn’t remain vacant for long in that city. I have such a bad track record with this that I’ve started making up restaurants that aren’t based at all on actual places. But if there’s a restaurant you really hate, I could probably kill it for you by writing about it. We start with the conclusion of the crazy magic immunity testing scheme and another appearance by the guy who thought he was turned into a frog. Looking back at it, I had way too much fun with that thread. I suspect it has something to do with the fact that it’s never the men I find interesting who get interested in me. If someone is going to be following me around, serenading me, giving me flowers, etc., it’s most likely someone who just makes me uncomfortable. Romantic interest is so seldom symmetrical, alas. Then we set up for our final showdown. The setting at the amusement park in New Jersey actually stemmed from a practical matter. When I’d finally decided I had to write this book after more than a year of thinking about it, I felt like I needed a research trip to New York before I could really write it. I’d been there for a conference the previous summer, and I’d done some wandering around at the time, but not really enough because I didn’t know enough about the story to know what I needed to look into. But a group of people I’d met online through Firefly fandom were planning a get-together in the fall at Wildwood, New Jersey. I figured I could get a ride from there to Philadelphia to catch a train to New York, so I could kill two birds with one stone and spend a couple of days in New York after the event. I guess it was kind of a leap of faith that I booked my return flight and hotel without having totally firmed up travel plans (though I’d already found one person willing to get me to the train station in Philadelphia). I ended up just getting a ride straight to New York, so it worked out. But then I was being scrupulous about which part of the expenses counted as a tax deduction. I knew my hotel in New York would count, but could I write off all my airfare, even if only half the time was devoted to work-related activity? Then I figured that if I used the setting of the other place I’d gone, I could write off all the airfare in good conscience. And the moment I had that thought, ideas started flowing. One of the mornings we were in New Jersey, it was really foggy. We were at an old-timey motel, the kind where all the rooms open onto a balcony/walkway overlooking a courtyard, a couple of blocks from the beach, where we could see all the rides on the boardwalk. A group of us sat out on the balcony, drinking tea and looking at the eerie way the top of the roller coaster emerged from the fog. That seemed like a really evocative image that would be a great setting for a fight, and I also like the idea of juxtaposing something so seemingly normal and wholesome like an amusement park with a magical battle. Now it seems like there’s no other place I could have set that scene, even though it stemmed from me being practical. I’m pretty sure the final chapter in the published book is different from what I initially wrote, but I don’t think I could tell you exactly how. I think there might have been more wrap-up and a bit more dithering. I did get some complaints about Katie not ending up with Owen at the end, but I’m a big fan of the slow build, and I didn’t want to move too quickly. I wanted to give just enough of a hint of possibility, but I wanted her to explore other options first so we’d have a basis for comparison and know Owen was the right guy. Besides, he’s kind of a chicken socially, so it would take a lot for him to be able to openly ask her out. In my mental backstory, he’s the one who first noticed her when he saw her in a bookstore and was attracted to her, and then in watching her from afar he noticed signs that might indicate she was immune to magic, and so they set up the test that morning on the subway. If you’re really shy, it’s harder to talk to someone who really matters to you, so it’s going to take him a while to work up the nerve and the comfort level to ask her out. I actually think I got them together too soon and I might have done things differently if I’d known how many more books there would be, but at the time I had a two-book contract with no real guarantee of more, so I didn’t want to leave that thread hanging. I know the very last scene, of her heading to the office on the subway and noticing the magical things but not being shocked, wasn’t my first draft, but now I can’t think of any other way I could have ended it. It’s a full-circle kind of thing, going back to where she was at the beginning and showing how much she’s already changed. It’s been fun re-reading this because it’s finally been so long since I wrote it that I can almost read it as a reader and not as the writer who still wants to tinker with it. I wrote this book largely because it was exactly the sort of thing I wanted to read, and I couldn’t find anything quite like it. I think that I’d have loved this book and become a huge fan if I’d just been a reader who found it — which seems rather obvious, since as the writer I was able to customize it to my personal tastes. Incidentally, the book is set in 2005. I wrote it in 2003 and planned it to take place in 2005 because I figured that was when it was most likely to be published if it sold, so I used a 2005 calendar to figure out days of the week and dates. This doesn’t really show in this book, but the later books are still set in 2005-2006 even though they were published later, so I had to keep checking technology levels. That’s why there’s not so much texting and people aren’t yet widely using smartphones. That sort of thing was more ubiquitous when the later books were published, but it was only just barely getting started at the time when the books were set. The first book actually takes place in the near future after the publication date (published in late May 2005, set in September-November 2005), but the rest happen after the time period in which they’re set. I don’t put any date stamps in the book, so they’re more or less timeless, aside from any trends, entertainment, and technology, but I tried to mentally keep everything in period.